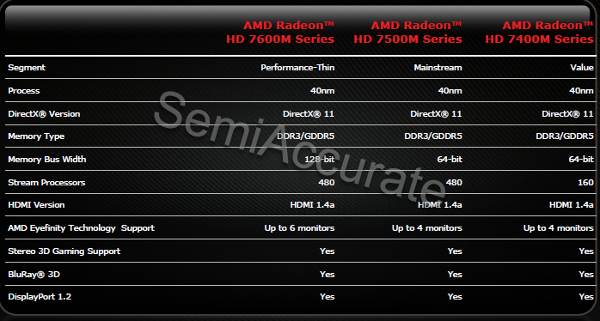 AMD (NYSE:AMD) is launching 3 all (not) new (at all) GPUs today, we welcome the (not) all new Radeon HD 7400M, 7500M, and 7600M. AMD is the first to readily admit these are renames with a few tweaks, so don’t get your hopes up for amazing new, well, anything. The (not) new chips are called Thames and Seymour, built on the same 40nm process as their 6000 series twins, Turks and Caicos. The new variants of the old chips are exactly what you would expect, 480 VLIW5 shaders for Thames, 160 VLIW5 shaders for Seymour, and slightly tweaked clocks, although we are not really sure what they are, and more skewed toward GDDR5 than the GDDR3/DDR3 generally found in the 6000 series. If you thought it was hard to get excited about low end VLIW5 parts a year ago, time hasn’t added much to the glory that is cheap consumer laptop graphics. That said, lets look at some of the reasoning for these *YAWN* (not) new parts. If you are going to point the finger at anyone for this bit of consumer deception, blame the OEMs. They are fixated on having something new to launch, and they now have something (not) new, but with a (really) new name. OK, to be fair, these (not) new GPUs are available in configurations that were not available in the older models, and due to two years or so of process development, are likely a bit more efficient, but, err, hey look, a bird out the window. Cool. Where were we? Oh yeah, *YAWN*. These parts are basically something that the OEMs said they needed, and would basically buy the renamed Nvidia parts if AMD didn’t rename theirs. AMD has nothing new in this rapidly dwindling market segment, so a few tens of MHz here, a few more there, and you have a (not) new line! On the bright side, it is limited to the low end, there are quite real 28nm laptop GPUs coming from AMD, but those aren’t available just yet. I am guessing those are going to make their public debut when Ivy Bridge launches this spring, it doesn’t make sense to do so before. On the brighter side, this market segment is just about done for. One big question is why 40nm, and why not VLIW4? Well, the short answer is that there are no 28nm chips yet, and the only VLIW4 GPU is the high end Cayman. Until there is an outcry for a 225W expensive entry level mobile GPUs, you won’t see that part in a laptop. In fact, with GCN/VLIW4+ set to replace VLIW4 next month, the days of that ISA are numbered.